Use peanut butter chips in place of the chocolate for a double-dose of peanutty flavor. Or play with cashew or almond butter in place of the peanut butter; any switch up of ingredients will work well. Party on! Melt twice the amount of chocolate chips, peanut butter, and butter in a large Dutch oven. Then carefully stir in the cereal until it’s well coated. Spread the mixture out onto two large rimmed baking sheet and sprinkle the cereal evenly with the powdered sugar, shaking it through a wire mesh sieve. Stir the cereal until it looks nice and snow-kissed. Store in airtight containers so the mixture stays crisp; warm, moist air will make it soggy. This puppy chow recipe requires only six ingredients that you’re likely to already have in your pantry, so you can make it whenever you’re feeling the need for a quick snack that satisfies your chocolate-peanut-butter-crunch cravings. 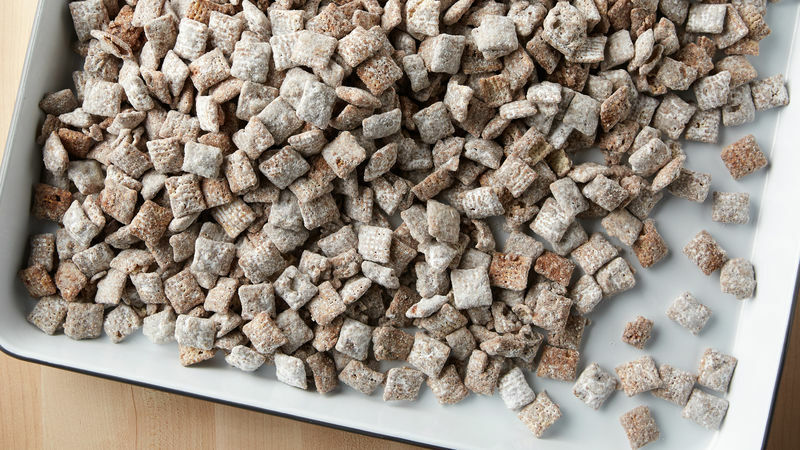 A bowl of Muddy Buddies will always be a welcome addition at any party or potluck. You can easily make a double or triple batch for quick-and-easy gifts for teachers, coaches and postal carriers. Easily packaged in cellophane bags or holiday-themed containers, shelf-stable puppy chow is a food gift that comes without any fussy storage requirements. If making Muddy Buddies has inspired you to create more of your own snacks at home, check out Betty’s best snack recipes, where you’ll find time-tested recipes and fun new twists on old favorites.